Looks like we're in for a bumpy ride, gentlemen. We're going to be playing a game every three days until the dawn of May. Rotation is no longer necessary; it's become a must. Bale seems to have picked up a knock (oh Carlo, you little devil you ) which means there's a slight chance we might see Isco and James playing on the wings tomorrow. 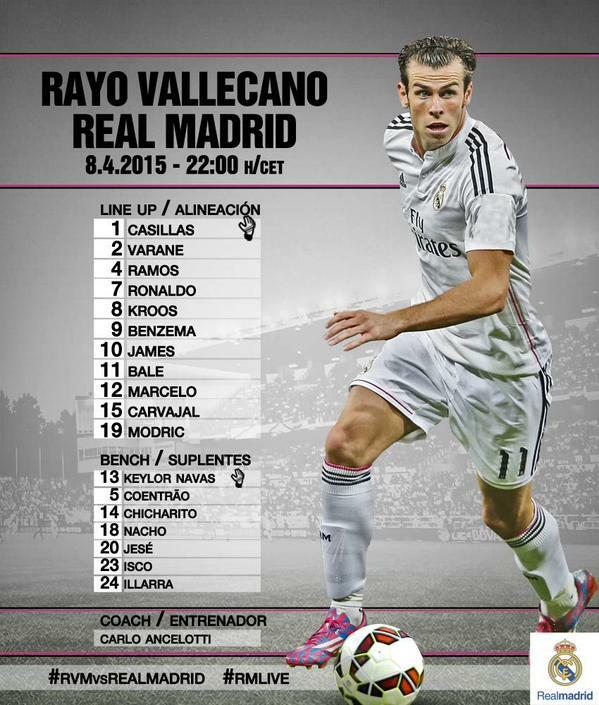 Probable lineup (Bale-less): Casillas; Carvajal, Varane, Ramos, Marcelo; Isco, Kroos, Modric, James; Ronaldo, Benzema. Probable lineup (in case Bale recovers in time from his ghost knock): Casillas; Carvajal, Varane, Ramos, Marcelo; James, Kroos, Modric; Bale, Ronaldo, Benzema. Pepe: Still recovering from a knock. Rayo's excellent recent form is not to be taken lightly. This is not another Granada, and we should walk onto the field realizing that. Bale, Benzema and Cristiano Ronaldo are going to be indispensable, but from time to time one of the three is going to be rested”. Frustrating first half. Rayo is pressing like cazy. Many, many, many misplaced passes and, surprisingly enough, some of these misplaced passes were down to the players misreading each other. We had three half-chances, but aside from that we were totally struggling to hold on to the ball, let alone get closer to their box. Modric is being closely marked, and that hurt us moving the ball forward. I really can't see a way out of this except to get Bale out and Isco in or wait until Rayo gets tired, which is not the way to go. But we know that's not gonna happen. Carlo will probably sub James for Isco at '65 and leave the rest the way it is. looool the ref has just gone berserk, denying a clear penalty and booking Ronaldo, Kroos and Bale. Nice goal by Ronaldo and nice run by Carvajal! Carlo puts on his tactical pants and it worked lovely. God bless Rayo, they are really a team that inspires quite a bit (to me) and I hope they continue to stay in the league but glad for the win. Madrid tho.. Were topping with four point yet it feels like Madrid are topping. Guess the only blemish on this team right now is coward ancelotti's insistence on fielding bale. otherwise at full strength, barca will need to be perfect for the remaining season (which is almost impossible) nice win and James BTW, what a playa. We've really overcome a stern test tonight. I really wanted us to win, partly for the title race, but mostly for the attitude shown by some Rayo players and officials. 1) As much as I hate complaining about refereeing errors, I must point out that the referee tonight denied Ronaldo a clear penalty even though he was a few meters away from the incident, and gave a couple of controversial (to say the least) bookings. 2)Rayo goalkeeper wasting time and making signals to the ballboy to take his time and not throw him the ball quickly. Disgusting. James, Ronaldo and Kroos were all booked in tonight's game against Rayo, and as a result, they'll all miss the Eibar match. Ramos, and Modric, on the other hand, are one booking away from suspension. They both need to keep a level-head given how hot-headed they usually are, especially Ramos. On a side note, If Ronaldo can manage to win the Pichichi, having played 4 games less (and still counting) than the second-placed candidate, it'd be a phenomenal feat. Ramos will eventually get suspended. You would just hope it isn't before a big game. 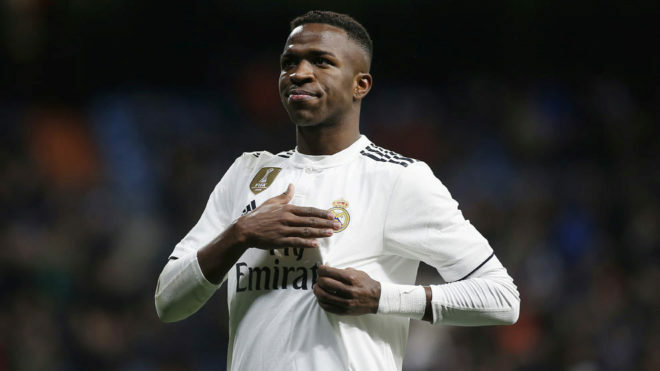 such a waste for a good player, hope him atleast become 1st choice backup next season, probably as left back, if coentrao left. Real has appealed CR7's sanction. Now, it's undeniable that the referee was on the wrong. But I kind of wished we hadn't. It's better for him to sit out the Eibar match than Sevilla's or Valencia's. I am with you on that. Eibar are bottom of the table. We could field a total new team and beat them.